I have two new paintings to show you, both which originals will be at my WonderGround Take Over event at Disneyland next month. Both of them however are now up at Strangeling.com as prints & canvases and are on sale this week - "Milagros: Mariposas" and "Straw Into Gold"
And finally - I have just updated my Events page here - there are events all over the world including California, Florida, Kansas City, Chicago, New Mexico, the UK, Atlanta & more! Be sure to hit the "subscribe" button to be alerted when I'm doing a show near you! Inspired by the wonderful milagros charms on a lot of the folk art I saw in Mexico last week. 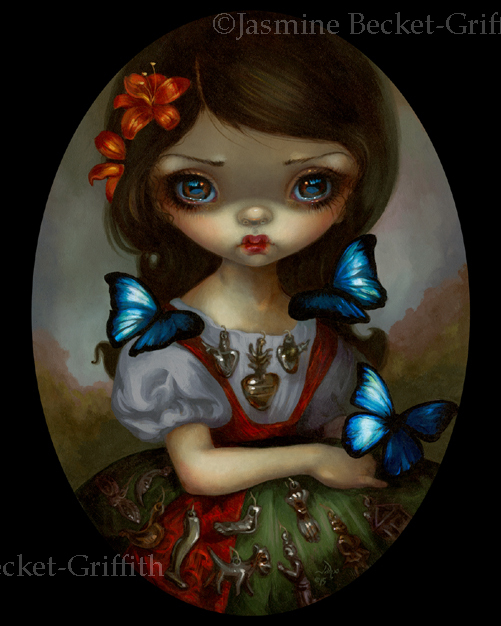 This lovely girl has many of them adorning her dress, surrounded by beautiful butterflies. Milagros charms are typically tied with a person's name, with the shape of the charm indicative of the healing/prayer wanted (ie a leg, if somebody is praying for their leg to be healed, etc.). I also saw them used as decorations sewn to clothing, glued to crosses, left at shrines, worn as jewelry, etc. This original painting ($3500) will be available at my "Artist Take Over" this July 10-12th 2015 at Disneyland's WonderGround Gallery in Anaheim, California, and we have prints & canvases available now up at Strangeling.com . I'm intending this to be the first of a series of pieces featuring Milagros! Not attending the event, but still interested in purchasing the original? 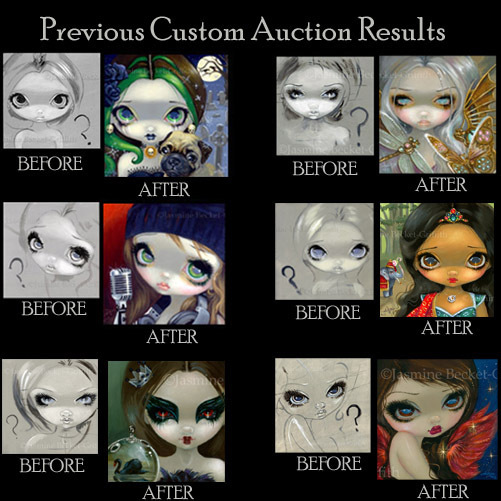 Email me at JasmineToad@aol.com with the subject line "Milagros: Mariposas" - I'm taking down collectors' names for a backup list in case the painting does not sell at the Disneyland event. Prints are on sale this week - $9.99 for 8x10"s and $19.99 for 12x16"s both glossy paper prints are signed by me on the back. Limited Edition Canvases are $125 and are 11x14" wrapped on boards, ready to hang, hand embellished by me in acrylic paints, signed, dated & numbered out of only 25 made. All types of prints are at my website here just use the print options dropdown box under Fine Art Prints in the middle of the page to make your selection. We ship anywhere in the world. 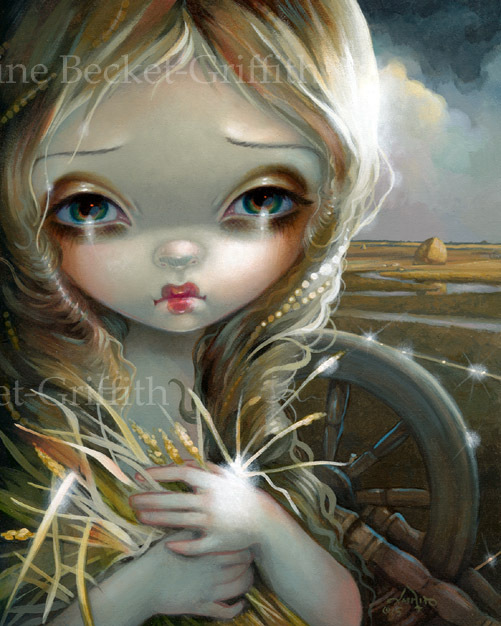 "Straw Into Gold" is an illustration for the Rumpelstiltskin card in my upcoming Faerytale Oracle deck! This painting illustrates the miller's daughter / princess / future queen character, clutching straw/hay which she is alleged to turn into gold with the spinning wheel behind her. Astute afficianados may notice the Hudson River school landscape of haystacks in the background wink emoticon This original painting will beautifully framed & will be available at my "Artist Take Over" this July 10-12th at Disneyland's WonderGround Gallery in Anaheim, California. First dibs on this painting will be for those attending the event. Not attending the event, but still interested in purchasing the original? Email me at JasmineToad@aol.com with the subject line "Straw Into Gold Original" - I'm taking down collectors' names for a backup list in case the painting does not sell at the Disneyland event. We already have prints & canvases available now up at Strangeling.com - the glossy paper prints are 8x10", on sale this week for only $9.99 and are signed on the back by me. 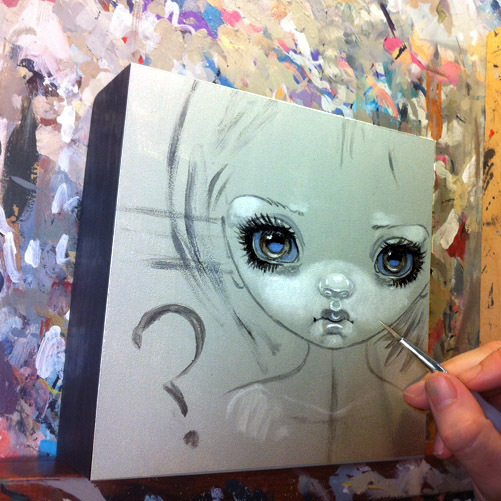 The Limited Edition Canvas prints are $100, also 8x10", wrapped on boards with a hanger on the back, hand embellished by me in acrylic paints, signed and numbered out of only 25 ever made. This is the 233rd installment in my Faces of Faery series. They are all 6x6 squares and are made to hang in groups! 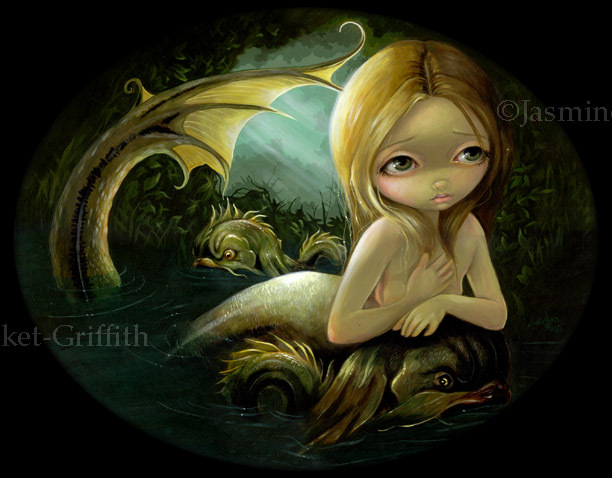 Definitely check out the rest of the Faces of Faery series here! It's true - the final "Alice in a Starry Night" Limited Edition Canvas is up for auction now here - we sold out SO fast! One of the Lt. Ed.s will also be at Dragon*Con later this year, but other than that they are all gone =( We do now have the Open Edition Canvases (also very nice, they aren't hand embellished or numbered but are the next best thing) and the glossy paper prints available here. "A Certain Slant of Light" is this week's SALE PRINT - from $9.99 HERE for the 8x10" prints, and only $19.99 for the big 12x16" prints, both are signed on the back by me and are glossy paper, very lovely! From 2010, the limited edition canvases have long since sold out but we still have the open edition 12x16" canvases, they are also on sale at only $90 each this week only. We have a different sale print each week at Strangeling.com - definitely check it out!